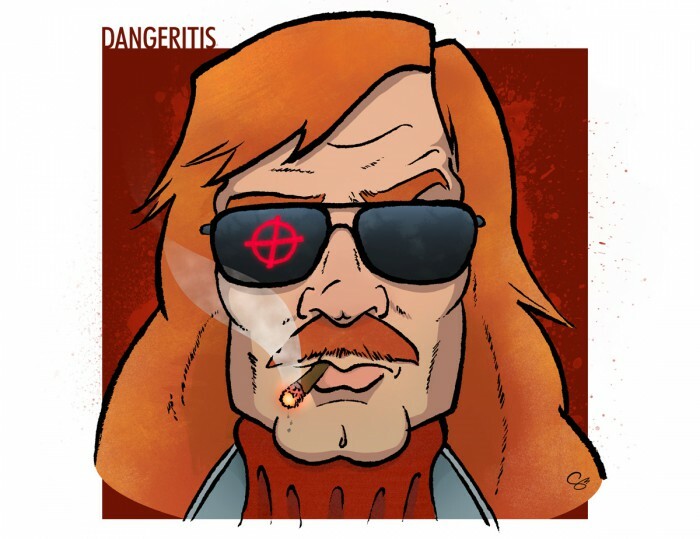 This January, super comickers Warwick Johnson-Cadwell and Robert Ball, started on joint comic project Dangeritis, about the misadventures of Derek Danger. 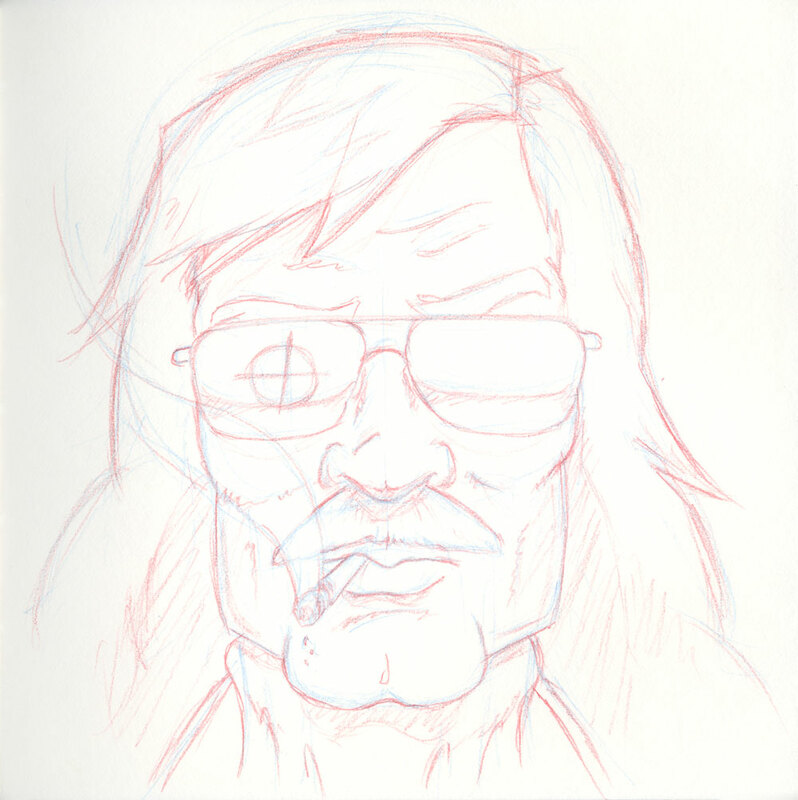 The sketches came thick and fast, building and rounding out Derek. The Britishness oozed through, and I was nuts for it. Well, that’s an exaggeration. If “went nuts” was 100%, I was around 80%. 100% would be a bit irresponsible. I wouldn’t be able to afford the repairs. The first few pages are up on the Dangeritis Tumblr as of this post. Some villainous looking sorts have just turned up, and at any moment there’ll be enough pages for me to tell you what it’s all actually about, but I’m excited to see the world unfurl. I’m already pretty big on Warwick’s work, and Robert is now on my horizon following last year’s trip to Thought Bubble in Leeds. Both have distinct, quite separate styles so watching them smash together to tell stories is going to be a lot of fun. I wanted to have a go at Derek so I busted out the sketchbook. This was the first time I’d sketched using blue and red coloured lead. I started with the blue to really rough out the general shapes, and turned to the red to put down some more definitive marks to help guide the final inking. There are two advantages to this. The first, by getting away from using just the one, greyish pencil, is it’s easier to be rough at first and build on the early lines without it all becoming a mash of one colour. I can make as much mess as I like with the blue, knowing I’ll clarify my intentions with the red. The second advantage comes when the inked art is scanned, as the blue and red can be filtered out, leaving just clear inks. With experience, you’d pick just blue or red, sketch everything out and go straight to inking. My linework is still pretty tight and cautious so using both helped me relax. It took approximately the length of one episode of Six Feet Under to get the pencils together. I was hesitant about directly inking the piece in my sketchbook so I followed some advice from the excellent David Wynne, and scanned in the pencils so I could print copies and experiment. I printed two-up on a sheet of 135gsm A4 and tried both my Pentel brush pen and fineliners out for size. I was really happy with the results from the brush pen and the control I had over the line weight; it allowed for some more organic marks on the cigarette ash, and I liked the way it took on the paper’s texture. The only spot I didn’t use the brush pen was the target on Derek’s shades.